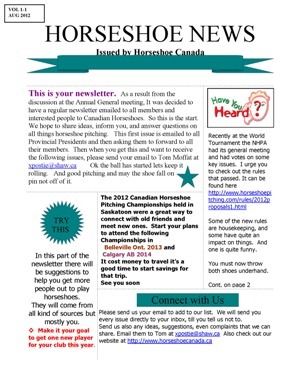 As a result of the 2012 AGM in Saskatoon it was decided to start a newsletter to help better communicate everything between Horseshoe Canada Executives and the players, Provincial Associations, and others. The first edition was published in August 2012 and can be downloaded below. 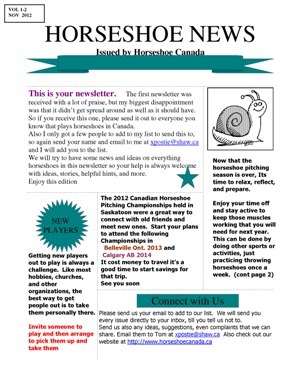 The newsletter, edited by HCA Vice-President Tom Moffat, is also sent by email to a list of officials and pitchers. 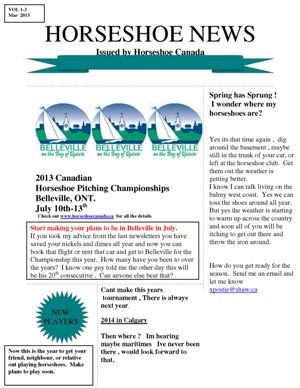 You are invited to forward it to all players and friends of horseshoes. If you want to be added to the email list please send your email to Tom Moffat (_xpostie@shaw.ca_). Click on image to download PDF document.